What’s the best all-around tire for my high-performance vehicle? It’s a question that gets asked over and over on social media, in the lunchroom at work, and at just about any motorsports gathering. 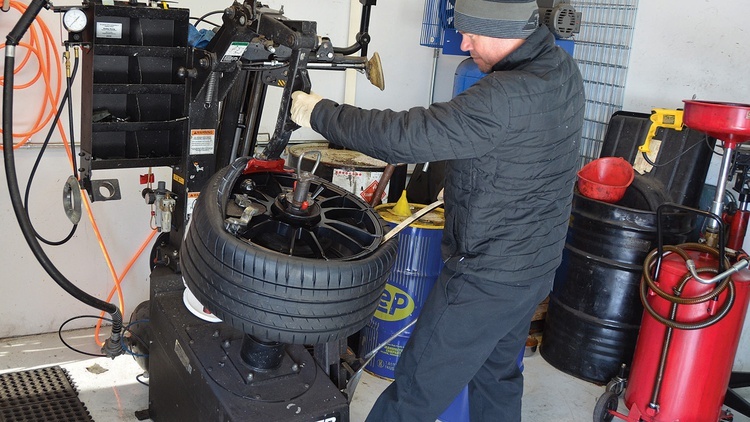 Since tires are the single most important factor in delivering performance on a car, getting them right is key to maximizing your enjoyment of your vehicle. Tire manufacturers respond to the challenge by offering a wide array of choices targeting a host of uses. 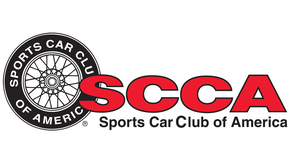 The more specific the use, the more focused a tire can be for that application: spirited daily driving, canyon carving, track days, autocross, wet or dry, cool or warm. Tire buyers tend to live in the real world, though, which means they don’t necessarily have lifestyles that lend themselves to a different set of tires for every different situation. That leaves us with one burning question: Can one tire do it all? We here at GRM tend to focus on the extreme-performance summer category, as those tires deliver the best dry performance–perfect for motorsports activities–while still being streetable enough for safe passage to and from events. But that laser focus on dry grip comes at the cost of streetability: These tires are loud, harsh, and can be a total handful to drive through wet puddles. Further, if ambient temperatures are below 50 degrees and it’s raining, these extreme compounds fail to activate–leaving you with no grip at all. As we saw in last issue’s comparison between the Michelin Pilot Super Sport and the new Continental ExtremeContact Sport, trading off some of the dry-weather performance found in the extreme category rubber can get you a much more well-rounded tire. These maximum-performance summer compounds put a larger emphasis on performance in all nonfreezing conditions. That’s why so many of the world’s best sports cars come fitted from the factory with these tires. They are suitable for daily use as well as occasional motorsports activities. These are legit street tires, too, not rules-beating, 200-treadwear offerings that could get a carmaker in hot water when unsuspecting customers drive off the road in a rainstorm. Michelin’s Pilot Super Sport has long been this category’s de facto leader for performance, especially in the dry, but at a higher price point, while Continental’s ExtremeContact DW has provided more value for some applications, especially when wet performance was key. Each of these manufacturers has recently introduced new offerings to address some of their deficiencies relative to the competition. Continental has worked hard with their new ExtremeContact Sport to improve dry grip while at the same time retaining category-leading wet performance, especially under braking. Michelin focused on the opposite need in creating their new Pilot Sport 4S, calling on their compound chemists to bring them up to speed on slick roads while giving up nothing in the dry. Did each company succeed? Time to find out. While Continental decided to launch their new ExtremeContact Sport in 71 sizes-meaning they have something for nearly all ends of the market–Michelin debuted their Pilot Sport 4S only in diameters of 19 inches and larger; additional sizes are at least a year away. This means that drivers of small cars will be choosing between the new Conti and the existing Pilot Super Sport, while those sporting big rubber can get their hands on the latest Michelin right now. Given that situation, we chose to forego our usual Mazda MX-5 test mule in favor of our 2012 McLaren MP4-12C. This is the same car we ran at last year’s One Lap of America and will likely run again in this year’s event. The McLaren, like many mid-engined supercars, uses a combination of 19-inch front and 20-inch rear tires; in this case, the OE sizes are 235/35R19 and 305/30R20. Early production delays meant we could not get the 305mm width in both brands, so we opted to test with the slightly smaller 295/30R20 at the rear. Up front we went a little bit wider than stock with a 255/30R19 size to counteract some of this car’s understeer. Our go-to guy for mounting tires on expensive and/or unobtanium wheels is Collin Stith at Soulspeed Performance. Although his high-performance and race prep shop is always busy, he graciously made time for us at the last minute so we could hit deadlines. He’s never scratched or bent a wheel in over a decade of mounting our stuff–and we mount a lot of stuff. That’s important, since squeezing 30-series tires onto wheels that cost well into four figures takes skill and confidence. Speaking of wheels, we matched the OE sizes–19×8.5-inch and 20×11-inch–with a second set of OZ Racing Ultraleggera HLT wheels from the Tire Rack. These are super strong, lightweight, and very cost effective. We are huge fans of these wheels, and have been working very closely with the folks in South Bend to find wider fitments for additional performance. This has included laser scanning our brakes, uprights and wheel wells, as well as modeling various combinations virtually. Look for more details in a future story. Viewing the Michelin and Conti tires side by side, several things jump out immediately. First off, in order to improve dry cornering ability, both brands have opted to remove some void area in the shoulders relative to their previous offerings, while wider inner tread blocks and fewer lateral sipes help with braking. Both of these changes can come at the cost of hydroplaning resistance. The changes to the Michelin appear more extreme in this regard; it now bears a strong resemblance to its dry track-focused cousin, the Sport Cup 2. In addition, the Pilot Sport 4S is simply wider in each of the sizes we used. Again, this helps in the dry, but can hurt when cutting through puddles at high rates of speed. It’s more difficult to see the differences in compounding approaches. 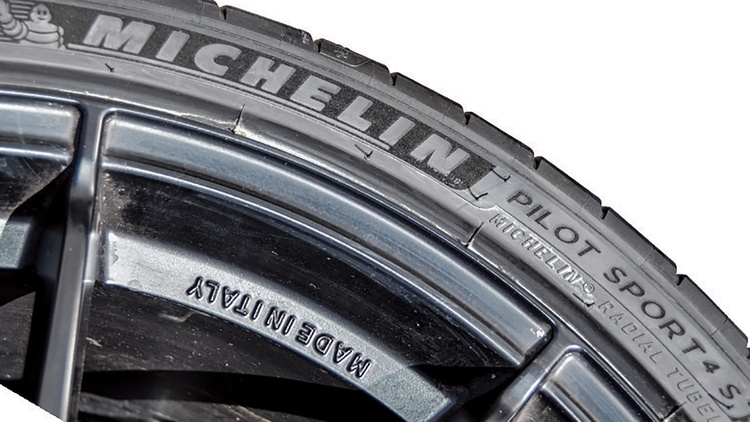 Michelin, as it did previously with the Pilot Super Sport, has laid up two distinct compounds side-by-side on the Pilot Sport 4S: The innermost side provides superior wet grip, while the outer band can withstand extreme cornering forces in the dry. Continental has chosen instead to use a single rubber compound, their new +Silane technology that promises ultimate grip in all conditions across the entire tire. Both companies made improvements in the carcasses to more evenly distribute cornering loads across the face of the tires under extreme lateral loading. We found both of these tires to be true delights for driving around at moderate speeds on twisty country roads. They are equally responsive and eager to carve through the corners with prodigious amounts of grip. The Michelin Pilot Sport 4S has a bit more control authority with small steering inputs, while the Continental ExtremeContact Sport has a slight delay and runs at larger slip angles, but these differences are fairly minor and not likely to be noticed by most drivers. There is more contrast in the ride quality, with the new Michelin transmitting road irregularities more directly and with higher audible output. We headed to our favorite test grounds at Harris Hill Raceway to put the new rubber through its paces and gather objective performance data. Built on some rolling hills in the Texas Hill Country, this facility has had a never-ending battle with underlying terrain movement. Repeated cycles of drought and flood mean bumps have a habit of appearing and/or moving every couple of months. Management stays after it with weekly patching and shaving, but occasionally a major sectional repave is necessary. One of these operations had been completed the week prior to our test session, and while some of our least-favorite bumps were now gone, the new asphalt was still a bit oily; we had to relearn our approach to these sections. Speaking of doing two things at once, this is where we saw the biggest advancement with the new Michelin: It now multi-tasks almost as well as the Conti. Combined with an improvement in straight-line deceleration, it meant we were able to use almost the same braking points for each tire. In the middle of the turn, the Michelin PS4S simply gripped the road harder than the Continental ExtremeContact Sport, carrying a bit more speed under steady-state loading. The Michelin would also overheat if slid around too much, and at the price of a reduction in mid-corner grip on subsequent corners. Resetting the timers and putting on our game face, we set out to lay down some consistent laps right at the limit. A car as potent as the McLaren makes this a challenge on a busy circuit like Harris Hill, however, so our lap times had a bit more variation than usual in our testing. Still, the results are pretty clear: Both tires are in the same ballpark, but the new Michelin is quicker. 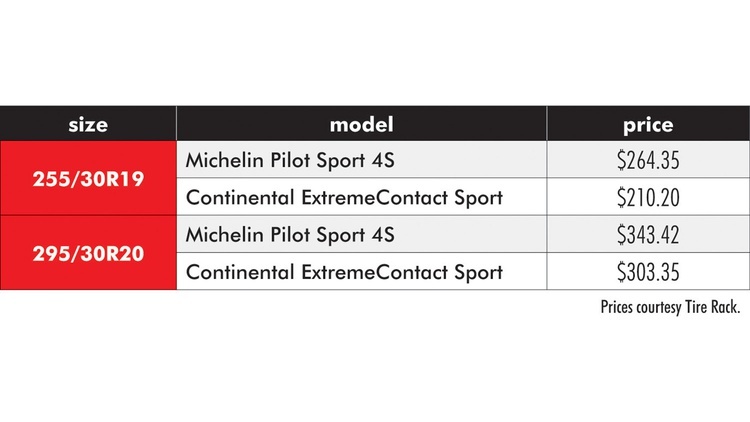 The Continental ExtremeContact Sport could crank out mid-1:24s all day long, but the Michelin PS4S dipped into the 1:23s for a flyer while running low 1:24s on average. Further validation came from a 1:23 we had recorded on the Michelins in the earlier practice session–in fact, during the very first hot lap we took after cleaning off the mold release. One note on the final bracket session on the Continentals: There are only three timed laps because the indicated fuel level went to zero. 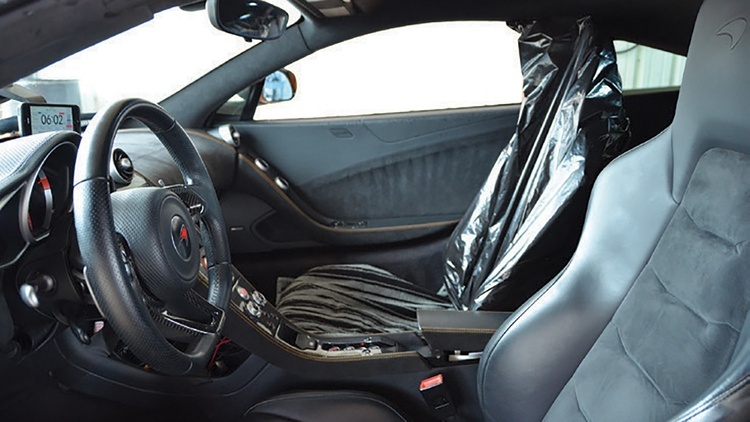 The 12C’s 620-horsepower, twin-turbo engine burns gasoline at a prodigious rate–16 gallons in just 28 laps–and we’ve found that the engine management gets very unhappy if you run the tank completely dry. As soon as our test tires arrived, we started anxiously watching the weather forecast for the possibility of precipitation, cross-checking it against various track schedules. Two days after we finished our dry test, the stars aligned and a band of rain was scheduled to come through the area the same day as an inexpensive, low-key open track day at Texas World Speedway. Although constantly under threat of being plowed under in favor of a housing development, this once-proud former NASCAR superspeedway continues to provide a low-cost road course fix to local motorsports enthusiasts. While the crumbling ’60s-era grandstands have long been condemned, the track itself has been patched together over the years to support use by NASA, SCCA and various marque clubs. Of the original oval, only the front straight is still fit for use, but rather than being limited to the typical infield “roval,” TWS turns across the flat back straight and heads out to the “outfield” for a series of challenging corners, some of which are lightly banked, before returning back inside the bowl for the steady-state carousel and the Larry/Moe/Curly switchbacks leading onto the front straight. It’s a great test of guts, acceleration and handling. Done right, it’s a thrill. We had limited track experience at TWS, and none in the wet, so we knew getting good data would be a challenge. Since wet weather performance is a key use of these tires, however, we wanted to at least get a subjective comparison, even if the data it provided was not objectively perfect. The track was open all day, with hourly 10-minute breaks for corner worker relief plus an hour for lunch. The McLaren’s fuel needs meant that a large part of each hour would be spent refilling the tank and changing tires. The day started off dry for two sessions. We ran the Contis first and gradually worked up to lap times in the 2:02 range. As at Harris Hill, we found that the Continentals were easy to drive to the limit on TWS, and very communicative. Bolting on the Michelins for the second session gave an immediate impression of more mid-corner grip, especially in the carousel, with authoritative turn-in. Lap times dropped just under the two-minute mark, backing up the differential we saw at Harris Hill. Near the end of the session, our automatic wipers came on, signaling the end of dry laps. A run to the nearest gas station took just enough time to allow the light rain to wet down the entire track. We returned near the end of the next session and headed out to scout the rain line. We found that a rimshot approach was the fast way on the outsection’s older pavement, where all of the apexes were highly polished, but back on the infield the normal dry lines produced good grip. The most challenging part was negotiating puddles at the infield exit to climb onto the front straight banking while trying to get to full power as quickly as possible. Screaming down the wet and bumpy front straight at 150 mph with rooster-tails flying was a bit scary, to say the least. We followed our scouting runs with a full session spent working up to quick wet times on the Michelin PS4S while dodging slower cars. Early in the outing we cracked off a 2:17, and clicked off a pair of 2:15s at the very end of the hour with active rain ceasing. We found the Michelin’s mid-corner grip superb in the wet, but when it broke loose there was chattering and heavy engagement of the 12C’s stability control. Yes, we were running in the wet with some mild nannies engaged (Sport mode) and you should, too. The rain came back during the lunch break, as we bolted on the Continentals. Standing water was starting to develop in a variety of places, most notably the middle apexes of the Larry/Moe/Curly setup. This gave us a good opportunity to evaluate hydroplaning resistance, since the more puddle we could cut across at Moe, the better the approach to the long front straight. The Continental ExtremeContact Sport ate this right up, slicing through with no problem. It gave up some mid-corner grip to the Michelin, however, which was immediately noticeable in the carousel. Breakaway and recovery near the limit were very smooth, however, and integrated seamlessly with the vehicle’s stability and traction controls. Our lap times on the Conti were a little slower at 2:17 to 2:18, but this could have been due simply to conditions. We bracketed our test results by remounting the Michelins for a final session. Mother Nature turned off the sprinklers for these laps, leaving the track to slowly drain; it was still quite wet and puddly. The very first lap out on the Michelin PS4S produced a confident 2:14. Mid-corner grip was back, and we had learned to keep the tire under the limit to avoid harsh nanny involvement–but we also got punted to the side of the track while trying to replicate the Conti’s ability to slice through the big puddle at Moe. Adding power early through the deep wet patches climbing onto the banking was also a no-go, delaying our front straight acceleration. 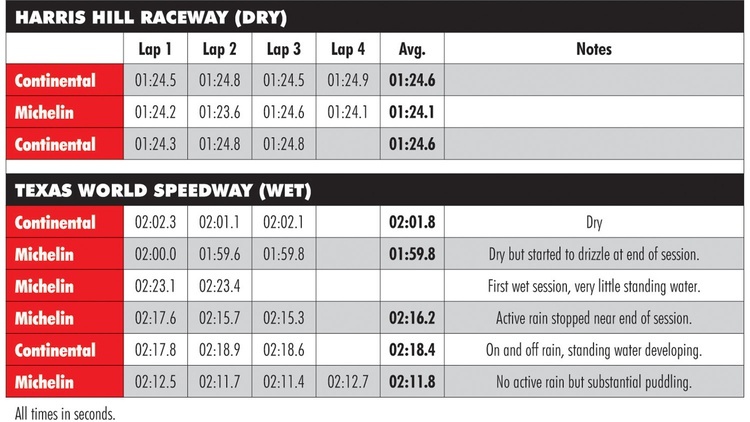 Working around these hydroplaning issues, we soon dropped into the 2:11–2:12 range consistently. The track was definitely better at this point, so the more important takeaways are the subjective impressions. The Michelin PS4S launch event saw the engineers who designed the tire explaining that their focus was on improving wet performance, especially under braking. This is, after all, a tire designed for daily driving that can also be used for spirited high-performance and occasional motorsports use. Our results show that the engineers’ efforts were a huge success. The Michelin PS4S is also designed for better dry performance through tweaks to both the belt package and tread pattern: less void, bigger tread blocks, more even tension. Again, our testing shows that these changes have succeeded, as the new tire delivered faster dry lap times than we saw with its already fast predecessor. Continental, not to be outdone, focused on improving their dry performance to bring their new ExtremeContact Sport tires up to the level of the Michelin PSS–and did so without compromising their already-superior wet use. If anything, the Conti ExtremeContact Sport is biased a bit more toward wet use, with wider longitudinal channels for evacuation and narrower tread widths in a given size. The Continental also had the best manners at the limit and will better tolerate the inputs of less-experienced drivers. So, which would we choose? For more focused daily driving duties with frequent wet weather encounters, we’d select the Continental due to its resistance to hydroplaning at speed. For more consistent dry use with only occasional precipitation, the new Michelin would be on our car–especially if it’s a modern, high-performance vehicle with the latest stability and traction control systems. Join Free Join our community to easily find more McLaren articles. Props to Michelin for improving the wet weather performance as much as they did. I ran the Conti Extreme Contact Sports last year and loved them. I'd probably still go with the Conti's since I don't need that half second of lap time potential for a street car. I'd prefer their stability if caught in a real downpour, plus they're a great value. That said, it would seem for those who are willing to pay and want that last tenth, the Michelin's have grabbed the crown. Ahhh... I misread this as a new compound that was just released. I see now this is actually a rehash of a June 2017 article. He was running the new white car at Nationals not this old lame orange one. We talked a LOT about which tire to use on One Lap this year, and for those of us who are mortals, it's hard to ignore the price difference. I'd still like to put the Michelins on the 911 if they can get to more normal car sizes. It was the lame orange one at Nationals. As usual, I have no idea what I'm talking about. I thought Ann said they traded in the Orange car, but maybe she said they traded in the GTR and kept the orange car? Anyway, having a McClaren as a backup for your CRX is a life goal. Once the kids are through college? To add, he only "won" day 1. Day 2 was dry and he ultimately finished 7th. Also in general, those that had the Michelins were ahead of those who had continentals. Driver plays a big factor, but still; big test set, multiple cars, and timed. I put the Continentals on my MR2 Spyder and am very happy with them for spirited street driving. Thanks for the update. He's a friend of mine on Facebook, and everyone talked a lot more about that first day than what happened on day 2. And yes, it was totally dry for Day 2 so I slipped to 7th. The PS4S is no match for the 200tw stuff in the dry. But...I had fun. Seth...we traded the GTR in on the white 570S that we ran in One Lap this year. That car is not yet classed for SCCA autocross. They came out with a second wave of sizes for PS4S early in 2018...lots of 17's and 18's now. Though nothing as small as the 15 & 16's that Conti is doing with the ECS. Good review and perfect timing for me. Had some white knuckle moments nursing my girl home from track yesterday in heavy rain and towing my tire trailer with my Mustang. Had been on MPSS for the last 2.5 years and they were great for daily and for track rain duty when newer, but in their highly worn and aged condition they just aren't the same thing anymore. I'll be giving the Conti's a shot. Sounds perfect for my needs and budget. I just put the ECS's on Betty and they have been a good match. I really like them as a daily tire for her. I'll probably do a set for the GSW here in a season or 2 since I'll have a set of winter tires for her. Great tire for a fun DD and really does well in the hills. tire sizes: 255/30R19 front, 295/30R20 rear. wheels: OEM 19×8.5-inch and 20×11-inch plus a second set of OZ Racing Ultraleggera HLT wheels from Tire Rack. 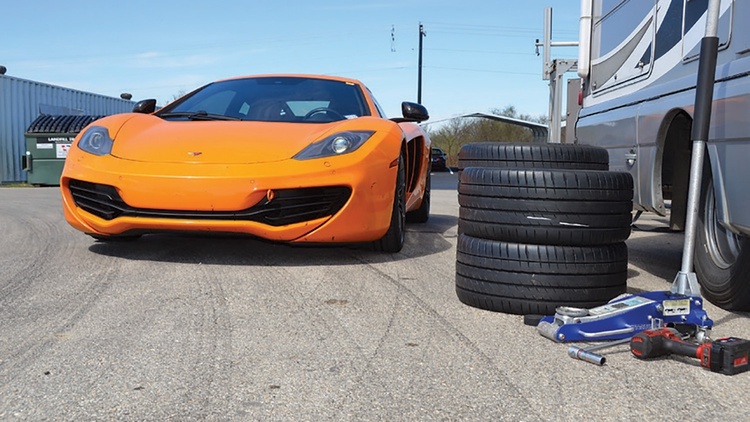 test vehicle: 2012 McLaren MP4-12C, the same car we ran at last year’s One Lap of America.